Maa ki jyoti se prem milta hai, sabke dilo ko marm milta hai, jo bhi jata hai MAA ke dwar , kuch na kuch jarur milta hai. SHUBH NAVRATRI. Aavo Ne Ramva Re Garbe Ghumva Re Maadi Tmne Jova May maa bless you With happiness all the year through! Wishing you a happy durga puja Fortunate is the one Who has learned to admire, But not to envy. Good wishes for a joyous Navratri, With a plenty of peace and prosperity. This Navratri, may you be blessed with good fortune As long as Ganeshji’s trunk, Wealth and prosperity as big as his stomach, Happiness as sweet as his ladoos And may your trouble be as small as his mouse. Bajre ki roti, aam ka achar, suraj ki kirne, khushiyo ki bahar, chanda ki chandni, apano ka pyar, mubarak ho aapko ‘NAVRATRI’ ka tyohar. PYAR KA TARANA UPHAR HO,KHUSHIYO KA NAZRANA BESHUMAR HO, NA RAHE KOI GAM KA EHSAS; AISA Navratra UTSAV IS saal ho, , . . HAPPY NAVRATRA. Ma Durga removes all obstacles and defects. • Lakshmi donate the internal or divine wealth of virtues or divine qualities. 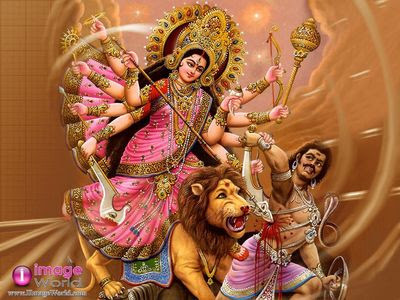 Festival of nine nights of Durga is here! Let’s celebrate and fill this day with much cheer! All of you have lots of fun. Celebrate the day and enjoy it next to none.